It wasn’t until the seventeenth century where a renaissance in thinking created a union between natural philosophy and sciences occurred. It’s no accident that one of history’s greatest scientists, Isaac Newton, titled one of his greatest works, The Mathematical Principles of Natural Philosophy. This book, along with the results of Benjamin Franklin’s kite experiment demonstrating the electrical nature of lightning, the funding for James Cook’s journey to Tahiti reaching Australia and New Zealand to track Venus, Charles Babbage’s Difference Engine, and the detection of the neutron (that would lead to the unleashing of the atom) are all linked to a 1660 invisible college of natural philosophers and physicians who gained Royal approval in 1663, known today as the Royal Society– the UK’s national science academy, and a Fellowship of over 1,600 of the world’s most eminent scientists. 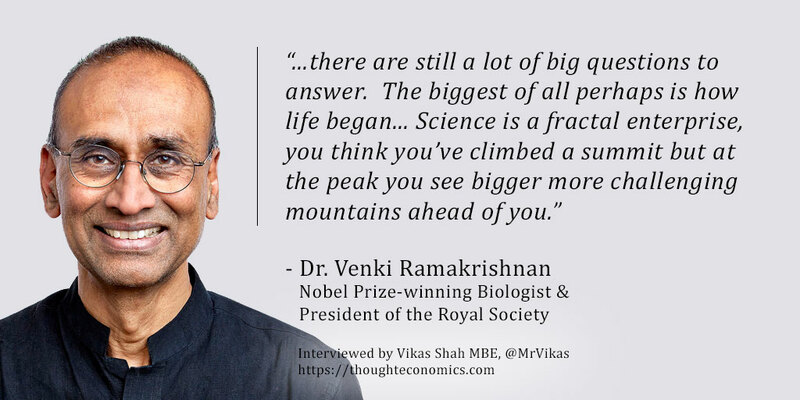 Sitting at the helm of the Royal Society is Dr. Venki Ramakrishnan, a Nobel Prize-winning biologist who is responsible for giving us some of the most fundamental insights into the biology of life itself. I caught up with Dr. Ramakrishnan to learn more about the role of science in society. Q: How did you decide to pursue a life in science? [Venki Ramakrishnan]: There was no single spark that got me into science. My parents were both scientists, so I was exposed to that world from an early age. I remember noticing that science was international – in our house in India, we would have visitors from many different countries and I found that fascinating. I also had a really good science teacher at school (which is really important), but when it came to choosing a career, I focused on getting into the Indian Institutes of Technology and becoming an engineer or getting into Vellore Medical College, a top medical school. In the end, I failed to get into either of those, but I did get the National Science Talent Scholarship modelled on the Westinghouse Scholarship in the US (now called the Regeneron Science Talent Search) which required you to study basic science. I chose to study in my home town at the University in Baroda because they were modernizing their physics curriculum. It’s funny but when my son went to Harvard to study Physics as an undergrad some 40 years later, he was being taught from the same textbooks (the Berkeley Physics Course)! Even this journey for me wasn’t straightforward. When I was in graduate school, I realized that my interests lay elsewhere, and immediately after getting a Ph.D. in physics I went to graduate school again, this time in biology. Luckily, that change has worked out. Q: Do people realise how important science is to society? [Venki Ramakrishnan]: On the whole, science is seen as one of the most trusted professions- and we need to retain that trust. I think a lot of people do understand and appreciate the importance of science but more needs to be done to communicate how central science and technology are, not just to our everyday lives – but to the decisions that are being made that affect all of us… decisions about data governance, genetic modification, agriculture and more. A lot of the decisions that will impact our future are underpinned by science, and whilst sometimes these decisions are made by governments – who are elected and hopefully transparent – many are made by corporations who are not generally accountable to the public. We’ve seen recently the challenges faced by Facebook, for example, as well as other companies who dominate the internet. It is essential that the public knows how deeply science and technology affect their lives. Q: How has the relationship of science with society changed? [Venki Ramakrishnan]: When you’re in the midst of an era, it’s difficult to judge the rate of change and what factors are the most important – we can only really do so in hindsight. My impression however is that the rate of change in society is accelerating as a result of rapid developments in science and technology. When you look back at when The Royal Society was founded, science was largely an amateur, gentlemanly pursuit funded by wealthy private patrons. If you look at the agrarian society of the 1600’s – not much would have changed in real terms compared to say the previous thousand years. But compare the 1600s to the present day, and what we do now would seem like magic to people from that era. That just shows you how dramatic the transformation of society has been as a result of science and technological advances. Science today is a huge, industrial scale activity and has a far greater impact on society than it did a few hundred years ago. Q: Why are we seeing such a rise in conspiracy theorists and ‘anti-science’ movements? [Venki Ramakrishnan]: Much of the pushback against science is related to a distrust of the establishment and of multinational corporations and their profit motive. You see that in the opposition to genetically modified crops which were, to a large extent, introduced by multinational businesses. Whilst GM crops have the potential to improve yields, be more resilient, and provide better nutrition – we see the discussion infused with distrust of monopolistic business practices, profit motive, and herbicide use. In many ways, there is a confusion between method or technology used to make a product, and what we should be concerned about is the product itself and its traits. It’s easy to spread fear; as humans we’re very tuned and sensitive to it. This is what we’ve seen with the anti-vaccine movement. The movement is in reality very small – but amplified by social media, where people segregate into echo chambers. It’s also compounded with the fact that on social media, you don’t often have a way to verify whether a source is trusted or expert or not. This also leads to deep questions about the motivations of ‘experts’! The Royal Society and other academies have an important role because we’re seen as trusted organisations without a particular agenda or axe to grind. We’re just the embodiment of our fellows who – in our case – are among the top scientists in the world. Our role is to be to be honest about what the current evidence is telling us, and to communicate uncertainties, truths and information in a balanced way. Q: How do we manage the ethical challenges raised by contemporary research? [Venki Ramakrishnan]: Academies have been working on ethical challenges for some time; the Royal Society launched a trio of studies in computer science on cyber security, machine learning, and data governance. Because of the ethical implications of data governance, the last study was done in conjunction with the British Academy, who represent humanities and social science just as we do the natural sciences. Many of the ethical questions in science are also social, not just technical, so it’s important to involve people from diverse disciplines, and engage the public. When assessing any new technology, getting experts to explain and understand the benefits and risks is only one aspect of the debate. We also need to involve the public and other stakeholders in a proper transparent discussion on how the technology will be adopted. Q: Do sciences and the humanities need to be closer? [Venki Ramakrishnan]: We absolutely need the sciences and the arts to be closer. A lot of my own personal efforts at the Royal Society have been around broadening our educational curriculum. In the UK if you look at the average number of A-Levels students now take, it’s below 3 – around 2.6 in fact, and that’s terrible. When my nephew came to Britain from the United States and went straight into A-Levels, it came as a real shock to him that students were pushed towards focusing on just a few science and math subjects when he (like so many young people) have really diverse interests. The disruptive technologies and changes in the future are best tackled by a broadly educated population, and we need to work on this with urgency. Broadening the curriculum also has an impact on diversity. Because of cultural and social prejudices (including peer pressure), young students from minority groups and girls often lack the confidence at an early stage to go into STEM subjects. The broader the curriculum, and the longer that these decisions can be delayed, the more diversity you’ll have in groups and thinking. Young people need the time and experience to really figure out what they want to do and acquire the confidence to do it. A lot of science is extremely visual, and art plays a big role. Visualisation of complex data is often the key to understanding it. The richness of visualisation in science, which has artistic qualities, helps us to arrive at insights that we would not otherwise. One of the things I am proud of is winning an award from the Wellcome trust for an illustration! Q: Is diversity a problem in science? [Venki Ramakrishnan]: Many scientific organisations are doing their best, but promoting diversity is an ongoing problem. One source of the problem is our unconscious bias. Humans are very good at quickly – and erroneously – generalising from patterns. So if we see activities that are predominantly white or predominantly male, we associate them as being predominantly for white people or men. We have to somehow overcome these biases. Slowing down decision making so that we are not relying on initial impressions which are more subject to bias, being aware of the problem and being proactive can all help. Another problem is that today’s research culture is not conducive to living a balanced life. The current career structure also makes flexible choices in life more difficult. Both of these inhibit wider participation. One reason people drop out of science is because they don’t like the career structure, or the life style of today’s research culture. Q: How do we keep science connected with government and industry? [Venki Ramakrishnan]: The academies, and certainly the Royal Society have always been involved in talking to government. We constantly have conversations with government about science policy, funding and outreach. When the Royal Society was founded, it had people from all walks of life- we had Samuel Pepys, a Naval Administrator, we had Christopher Wren, an architect. It’s true that at points in history we may have become more inward looking, but over the past 5-10 years, the society has made a strong effort to engage with industry. We have the Royal Society Industrial Fellowship program and one of the highlights in our calendar is Labs to Riches where we celebrate entrepreneurship in the sciences. The attitudes towards entrepreneurship have also changed in Britain. Many more scientists are interested in starting up companies and the number of startups has grown significantly in recent years. Q: What are some of the great questions we have left to answer? [Venki Ramakrishnan]: In my own field, biology, there are still a lot of big questions to answer. The biggest of all perhaps is how life began. We still don’t know how life started from a soup of chemicals – how molecules assembled, replicated, and managed to survive and evolve into incredibly complex life forms. We also don’t know how likely this was, and if we ever able to answer that, it will give us a better idea of whether we’re alone in the universe. Although I am not sure life elsewhere would be immediately recognisable. Another big question is the evolution of intelligence, and the mechanisms underlying memory, behaviour and consciousness. Even simple questions like how we instantly recognise a familiar face in a crowd or remember a phone number are deep complex questions. But people are making tremendous strides understanding the brain using some brilliant new technologies. Venkatraman ‘Venki’ Ramakrishnan is a Nobel Prize-winning biologist whose many scientific contributions include his work on the atomic structure of the ribosome. As the site within living cells where the genetic information is read to synthesise proteins from amino acids, improved understanding of the ribosome has yielded many fundamental biological insights. He determined the atomic structure of the 30S ribosomal subunit followed by structures of the entire ribosome in many different states and in complexes with several antibiotics. More recently, he has been using electron microscopy to visualise ribosomes in action in higher organisms. This work has advanced our understanding of how the ribosome works and how antibiotics inhibit it. In the past he has also worked on histone and chromatin structure, which help us to understand how DNA is organised in cells. Venki received the Nobel Prize in Chemistry for his work on ribosomal structure and was knighted in 2012. He is a Member of the US National Academy of Sciences, Leopoldina and EMBO, and a Foreign Member of the Indian National Science Academy. In 2015, he was elected as President of the Royal Society for a five-year term.